« Is music getting more profane? Last week The Echo Nest and Spotify announced an integration of APIs making it easy for developers to write Spotify Apps that take advantage of the deep music intelligence offered by the Echo Nest. The integration is via Project Rosetta Stone (PRS). PRS is an ID mapping layer in the API that allows developers to use the IDs from any supported music service with the Echo Nest API. For instance, a developer can request via the Echo Nest playlist API a playlist seeded with a Spotify artist ID and receive Spotify track IDs in the results. 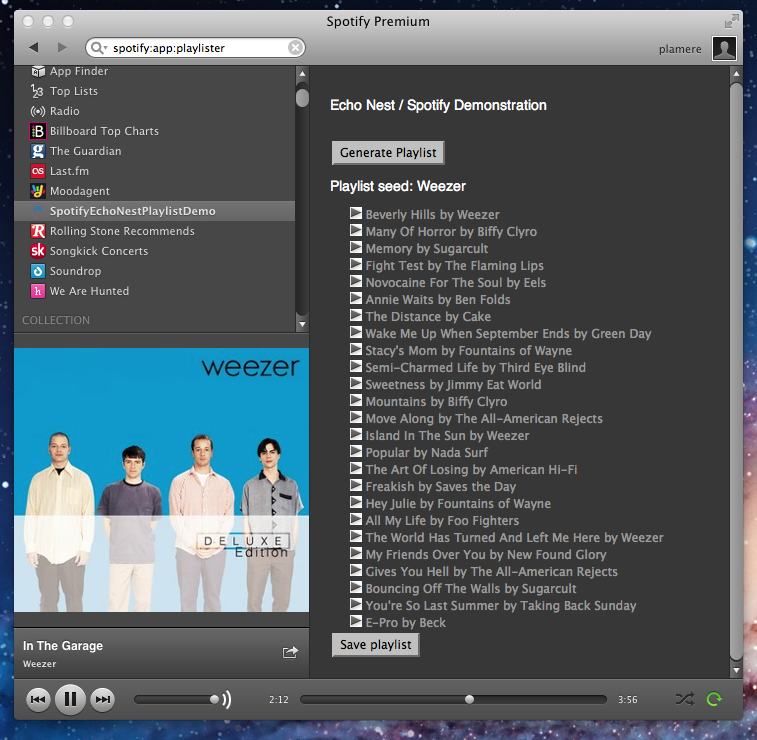 Allows the user to save the generated playlist as a Spotify playlist. makePlaylistFromNowPlaying() – grabs the current track from spotify and fetches and displays the playlist from The Echo Nest. Update: I was using a deprecated method of playing tracks. I’ve updated the code and example to show the preferred method (Thanks @mager). manifest.json – describes your app to Spotify. The most important bit is the ‘RequiredPermissions’ section that lists ‘http://*echonest.com&#8217;. Without this entry, your app won’t be able to talk to The Echo Nest. To run the app type ‘spotify:app:playlister’ in the Spotify search bar. The app should appear in the main window. Well, that’s it – a Spotify playlisting app that uses the Echo Nest playlist API to generate the playlist. Of course, this is just the tip of the iceberg. With the Spotify/Echo Nest connection you can easily make apps that use all of the Echo Nest artist data: artist news, reviews, blogs, images, bios etc, as well as all of the detailed Echo Nest song data: tempo, energy, danceability, loudness, key, mode etc. Spotify has created an awesome music app platform. With the Spotify/Echo Nest connection, this platform has just got more awesome. This entry was posted on April 7, 2012, 9:40 am and is filed under code, Music, The Echo Nest. You can follow any responses to this entry through RSS 2.0. Both comments and pings are currently closed.